I'm always late to the literary party. Even when I have it together enough to buy a hot new book, I usually toss it into my giant queue of books I want to read, and I still don't get to it for a couple of years. This book, for example, was published four years ago and even the even movie has come and gone. As a fad, it is over. And still the only reason I got to it was that a friend put a copy in my hands and told me to OMG just read it already.As an adult, I almost never read YA novels. Not as a policy, but out of taste. I broke that rule with [b:Twilight|41865|Twilight (Twilight, #1)|Stephenie Meyer|http://d.gr-assets.com/books/1307515757s/41865.jpg|3212258] and regretted it (how could you make a vampire book unfun? Oh, I see now). 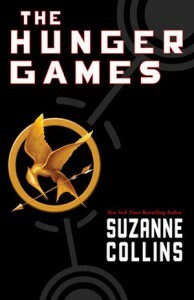 In fact, I disliked Twilight so much that I didn't even want to read The Hunger Games. But, at the insistence of my friend, I gave it a try. Needless to say, I was immediately hooked. I love that sensation of being only a few pages in and knowing you're not going to fall asleep on time until the whole thing is finished, and being happy because it is still all ahead of you.I really liked Katniss. I liked that she was a little grumpy and withdrawn, and stubborn, and that she made mistakes, and I think liking her that much was the difference between liking the book 3 stars and liking it 4 stars. Most of what I saw as flaws with the book, like the dark and very unlikely gladiator games plot device, or the sort of uninspired prose, are probably necessities of the young adult genre. If this book were written for adults, I would expect it to be very different. So I'm not going to complain that the televised Hunger Games as an institution would never happen in real life, and that it's too heavy-handed a metaphor for social cruelty, because: young adult. If this book is too unsophisticated for you, you're reading the wrong genre.That said, I absolutely would recommend it to teenage readers, and I kind of wish I could have read it in my youth too, so I could have been more swept away by it. But even as a jaded adult, I found myself a little inspired at the end. I may not be able to kill a squirrel for dinner, but I could stand to be a little tougher. Wow, did I just admit that a YA novel changed my life? I really liked this book.